A couple of weeks back I put out an article saying that "The Shoeshine Boy" principle may have flagged a major top in the gold market. 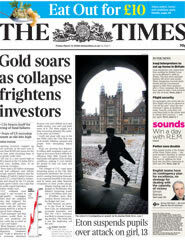 The Times cover trumpeting gold was published one trading day before gold's $1030 top and is shown below. Not surprisingly this generated a number of emails from gold bulls which with one exception disagreed to the point of employing four letter words you would not even use against alleged members of a gold cartel. Let me clarify one point, the use of the phrase "Death of Gold" was a play on the phrase "Death of Equities" though some readers thought this meant gold going back to $300 for the next 20 years. Gold is still in a bull market but now it is time to explain one aspect of gold bull markets that gold investors probably ignore and that is sizeable corrections big enough to be called bear markets. Now when gold investors think of reaping in precious metal profits they think of the gold bull of 1970 to 1980 as a benchmark. The graph for that familiar event is shown below. Many will recount gold at $850 in January 1980 and will tell you that this is somewhere near $2500 in inflation adjusted terms. But not many talk about the big dip in the middle of that bull market. Let's zoom in on that period between 1974 and 1978 to get a lesson on how bull markets can give the impression they have died never to come back again. Just like our current bull market, gold got off to a flyer rising by a factor of 5.6 times in five years. Compare that to this current bull which has run for seven years and has risen by a factor of 4.1 in that time. We have here two comparable performances both reflecting the mood of the time. When gold topped in December 1974 at $195 we were seeing comparable fears to what we have today. Inflation in the USA had risen from 2.7% in June 1972 to 12% in December 1974 spurred on by a quadrupling of oil prices. The US Dollar index had dropped from 120 in January 1971 to 98 by December 1974. The real rate of interest had plummeted from about 3.5% to -4.7% by December 1974 as Fed interest rates failed to keep up with inflation. Everything looked in place for the gold bull to continue and I bet there were plenty of cheerleaders egging on gold investors at that time! Then gold corrected and viciously as it lost more than half of its gains and the $195 high of December 1974 was not exceeded again for over three and a half years! How many gold investors were expecting that to happen? Not many I think. So why did gold correct so much? Inflation dropped down to 5%, the US Dollar Index rallied to 107 and the real rate of interest got back into positive territory at 2.6%. If such a correction prevailed today, gold would drop below $500 and would not take out $1000 again until the end of 2011. Of course I am not saying that gold must drop to $500 but gold (and silver) investors need to realize that things do not keep going up and up. They need to balance future hopes with past realities. If the 1970s gold bull market teaches us anything it is not to be presumptuous about how high an asset value can go. But as they say, one man's disaster is another man's opportunity. Nail the bottom of this current correction and you will realize even greater profits as gold and silver take off again into the stratosphere in the years to come. Inflation, the US Dollar and real interest rates all went belly up again as gold hit the bottom in August 1976. Those who got in then at $103 would see gold increase another 8 fold. What is an eight fold increase from a bottom like 1976? Something worth waiting for, that's what it is.